If you know what this is, you must be from the Midwest. Here in Iowa there is nothing quite like a loose meat sandwich, or Maid-Rite, as many of us grew up calling them. 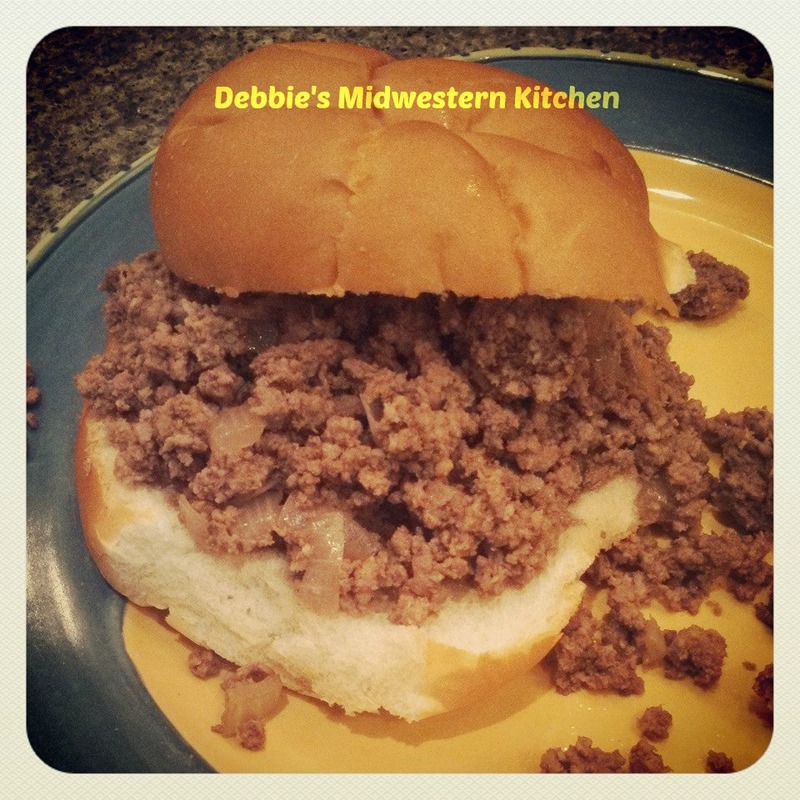 This delicious sandwich with meat messily spilling over the edges of the bun is a staple for many Iowan meals. The Maid-Rite sandwich was popularized back in 1926 by a man named Fred Angell. He began franchising the idea and a chain of restaurants called Maid-Rite began to spread throughout Iowa. Today one of the few original shops remains in Marshalltown, Iowa – Taylor’s Maid-Rite. 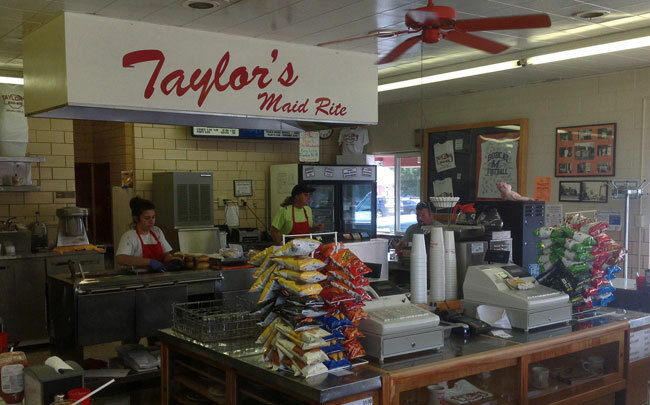 Several new shops have emerged over the years and have been grandfathered in through the franchise, but Taylor’s is one of the originals and a favorite of many long time Maid-Rite fans. I have vivid memories of Taylor’s in Marshalltown. I played softball in high school and our coach was a huge fan of Taylor’s Maid-Rites. Every time we went to Marshalltown to play a game, we would drop off the freshman and JV teams and our coach and the varsity players would head over to Taylor’s to enjoy a yummy, mouth-watering loose meat sandwich. That tells you how much he, along with many others, love these sandwiches! Growing up we ate Maid-Rites all the time, whether it was at the actual sandwich shop (we were lucky enough to have one in Mason City), my mom making her own version, or at the local fairgrounds during our county fair. Everyone seemed to have loose meat sandwiches. Anytime I catch the scent of a Maid-Rite it instantly transports me back to my childhood. 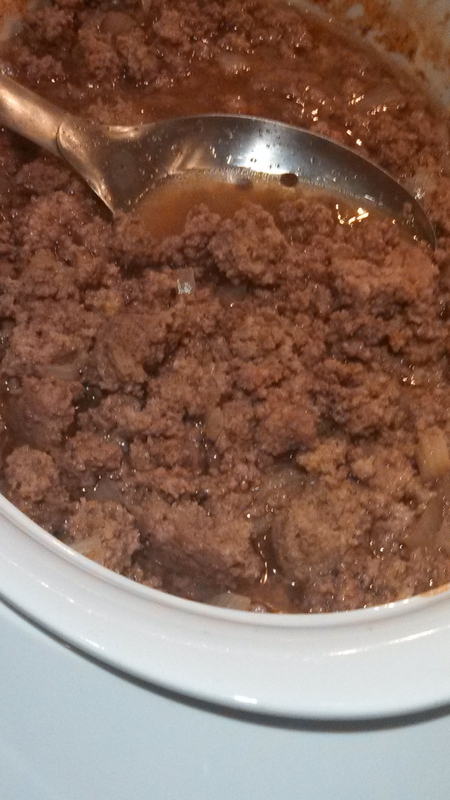 Here is an easy Crock Pot Maid-Rite recipe we have enjoyed in our house. I’ve even learned to enjoy them without ketchup, using the traditional condiments of mustard, onions, and pickles 🙂 It’s easy to throw together and the crock pot takes care of the rest. You’ll feel like you’ve taken a trip to an authentic Maid-Rite shop here in Iowa! Add the first nine ingredients to the crock pot. Stir together to combine ingredients and break up the ground beef. Cook on High for 4 hours. Stir occasionally to combine ingredients as they cook and to keep the beef from clumping together. The smell that emerges from the crock pot each time you stir it is to die for! Serve on hamburger buns…dont’ be shy, the messier it is the more authentic the sandwich! Serve with condiments of your choice but remember the traditional condiments are pickles and mustard which I highly recommend. Have you ever had a “loose meat” sandwhich from the Canteen in Ottumwa iowa ? We’ve had the maid rite restaurants here but they don’t even compare to the canteens . Maybe one day you can try it. Google Canteen lunch in the alley. Toni – I’ve never had one from the Canteen but I’ve had many people recommend it to me. Hopefully, I’ll get down there and give it try some day soon! I’ve tried many recipes for mock maidrites, many of them almost right, but none in the crockpot – I’ll give it a try. 🙂 Question – the recipe doesn’t say to fry up the burger before putting it in the crockpot. Do you put it in raw? Brenda – yes…just put it in raw. Hope you enjoy it! What kind of pickles? Dill or sweet? Hi, I’m a Midwest blogger, too – grew up in Iowa and live in Minnesota, so I was happy when some of my home-town girls passed around this link on Facebook! Nice to meet you, and it will be fun nosing around your blog! And I love Maid Rites, too! Without ketchup…. I hope you enjoy some of my recipes and posts 🙂 Nice to meet you and welcome! I am born & raised In Iowa. QCA Moved to Pacific Northwest (Vancouver WA) 2 yrs ago. I am a foodie & it’s been rough on me, No Maidrites, or SteaknShakes, no Golden Corral, or Happy Joes, no Caseys or Harris Pizzas, no Culvers or Whityes, or Rudy’s Tacos! When I saw this recipe I hoped it would be good. I had always been told the secret to good maidrites was a can of cola or coke syrup. Someone even said rootbeer extract(not true Tryed it) when my daughter & I got brave to make this we were out of wochestershire sauce so we substituted steak sauce, not quite the same that way but close enough! We thank you for sharing this recipe, I Do so miss QC food! Oh & I don’t eat mustard- take mine w/ xtra onion, xtra pickle & catsup! Bonny – I’m glad you enjoyed the recipe! Mm mm… I miss Rudys tacos… I starve myself before going to Waterloo just to gorge on Rudys. Casey’s pizza….I miss it SO BAD!!! I’m from MO & transplanted to Louisiana state, it has taken me a while to learn to eat here. Seriously miss friend tenderloin sandwiches from The Apple Basket Café in Macon,MO. Casey’s is moving south as they are now in Northwest Arkansas where I moved from the Macon/ Moberly Area. I always preferred the tenderloins from Don’s in Moberly to the Apple Baskets though. I have came up with a pretty good recipe for the breading for tenderloins though and my family likes it. I miss the onion rings from Pear Tree though, as I have not been able to duplicate those. Grew up in rural northwest IL, and I live in Columbia, SC now. I MISS CASEY’S PIZZA SO MUCH!!! Man do I feel ya, Bonny. I grew up in the QCA as well and now live in Idaho. I’m fortunate enough to go see my parents maybe once a year, but there is never enough time to go everywhere. I almost always manage to hit up Harris, Rudy’s and Whitey’s, and sometimes Steak ‘n’ Shake. I haven’t had a Maidrite in forever. People out here don’t know what they’re missing! I am also from Muscatine, and i know maid rites very well, i am old and remember the first rest. my dad was a friend of angell and we made what was called beef burgers in the drive in they ran back in the 50’s not to be confused with the maid rite, however was in Musc in Sept and sure didn’t taste the same…. next time you try t o make them add a can of campbells beet broth, you will find its the closest to them, as that is what they used some beef broth. not cooked in a crock pot, in a pan on stove and just keep stiring breaking up the meet. hope you enjoy… this is my email, drop me a line sometime as a fellow iowan. The original Maid Rite is in Muscatine. Though this recipe may be close, you are missing the main ingredient that gives it that Maid Rite flavor. What is the missing ingredient? I so miss Maid Rites! We were in Iowa this past summer and found a restaurant in Marion that served delicious Maid Rites…….along with shoestring fried onion rings that were to die for! I am definitely going to try this recipe!! Jane……What is the main ingredient……if you would be so kind…..!!! I put dill pickles on ours and love the way they compliment the sandwich! Dill pickles only, but not chips or spears. You have to find a supplier of the thin fast food style slices. Also, catsup is not allowed, only yellow mustard. I forgot to say, Kroger’s offers these thin dill slices in their own brand, at most stores in their various chains. Former Iowan too. I just began making maid rites for my boat crew. Looking forward to trying the crock pot recipie. My recipe is all standard but I cook the meat down with a can of good beer. I know everyone has his own recipe. The secret here is cooling the beef very well in liquid. I started doing it a few years back in the pressure cooker. I “gray” the beef in a skillet, just to take the pink out, over fairly low heat, breaking it up very well. Don’t brown it. You can add your onion at this time. Then into the pressure cooker for 14 minutes with some Jameson’s beef seasoning and a few other seasonings, including black pepper, a tiny bit of sugar and some beef broth. This is very good, quicker than the crock pot and better than what you get in the Maid-Rite restaurants. I have recently started adding some prepared yellow mustard to the cooker (a la the Taverns in Sioux City). Loose Meat’s in Sioux City are called Taverns. Try a Charlie Boy at Miles Inn. It is worth the trip. I personally think Maid Rites have gone down hill. They usually are too dry but depends on the place. I had one last Thursday along I-80 at the Amana interchange and it was sawdust on a bun. My experiences at The Beloved Taylors in the past two years have been the same, too dry to choke down. These people need to stop trying to make these into health food. I had a couple in the one remaining shop in Muscatine in October that was very good. Just ask for a wet maidrite at Taylor’s, more like the original, lots of flavor! My Dad and his siblings grew up in Marshalltown, and they all have memories of Maid-Rite. A few years ago on a cross country trip, my husband planned our route to go through Marshalltown so that we could experience it. My Dad was tickled! We also found his Dad’s old business and their old family home. I shared this recipe with some of them. Kelley – I hope they enjoy this recipe! Made last night…..Very good…..Thank you for sharing…..!!! I grew up in Marshalltown and went to Taylor’s all the time. Thank you for the pictures and the recipe. Can’t wait to try it! This recipe is so wrong..but if it is good who cares. ?.enjoy.We had the Indianola Maid-Rite for 37 yrs. It was a small place that had been added onto over the years,some of my classmates were ‘roller skating’ waitress’s there in high school . we operated for 10 yrs in old building and built new building and operated there for 38yrs (5 yrs leased out so we could travel before we got too old!) ,we raised 5 kids in the business. When we started they were 9 mths, 3yrs,6 yrs 10 & 12, believe me that was a circus~!Paypen,high chair in little dinky kitchen. They all know how to work. We added hot beef sandwiches,home sliced ,tenderized and abreaded by ME only. tenderloins.Everything was homemade pies,noodles,real mashed potatoes,soups and on and on..
We are very grateful for our long run,but it took a lot of blood sweat and tears~ also,we neither one had ever worked in a restaurant! Hi Sandy… *Congratulations* on homemade food. I am 52 yrs. old… I live in Altoona Iowa… I was taught to cook & bake ALL by scratch too. Cheaper & delicious. Take “PRIDE” & “LOVE” in making your food by your *BEST* tools-the 2 hands attached to your arms. I give you praise for doing everything by hand. You left PROUD! I too love to bake pies. how would you cook them ? LOVE this! We are pork farmers and rarely have ground beef in the freezer, maybe I’ll try a ground pork version as I can’t wait to try this out! Lived in muscatine and had made rites and still do when I come back to town. The last trip I brought back a dozen not one went waste. Please don’t give out a licensed recipe. And please don’t ask. I grew up in Bettendorf Iowa. Lots of good memories of home made Maid-Rites and a local famous place Ross’s with the best Maid-Rites around. If you are ever in the Quad Cities check them out. Located under the bridge in Bettendorf. Your recipe is simmering away as I type. There’s also a Maid-Rite in West Liberty. I grew up with it. There were a couple over time, and yes, they had ketchup on the counters and tables. I also went to ones in Davenport and Muscatine. Now it’s resurrected again in W.L. YAY. I made this as per the recipe, but I didn’t like it at all. It didn’t taste like the loose meat sandwiches I used to have as a child in Iowa. Is the ground beef cooked before u put it in the crockpot? Colleen – No, just put it in raw! I try to use the leanest beef I can find. Enjoy! I grew up in Marshalltown — have no idea why you’d add all this sugar, syrups and sauces. The key is simply to steam the hamburger, mix in a little onion powder and you’ve got a dead ringer. A fresh, fresh bun makes a huge difference. Mesa, AZ, has an “Iowa Cafe” restaurant that serves a version that sounds like your recipe. We ordered them once — left them on the table. Never had a Maid Rite with all that goo. My Grandma lived in Columbus Jct. Iowa and I was always told that Root Beer was the secret ingredients to the Maid-rites. I am from Sioux City and our local Dairy Queen is the only Dairy Queen I have ever found that has “Taverns”. Now I live in Southwest Iowa and they don’t say Loosemeats, maid-rites, or taverns. They call them sloppy joes and put a can of chicken gumbo soup in the crumbled hamburger! Pretty good and very popular at the FFA building during the County Fair! There is a Maid rite in Rockford Il. I also lived in Charles City Iowa. Ate a lot of Maid Rites. Now live in Beloit Wi,and when In Rkfd. always stop and pick one up!!!!!!! My favorite maid-rite was Fairfield,ia. (no longer there)Then I think there was one in Tama too that was good.There are two in West Burlington.One in the mall,and one by itself.I try them occasionally and refer to them as “Maid-Wrongs”,I don’t know the exact way to dial one in,but one of the old gals in Fairfield told me the Coka Cola thing once as well. what % of gr. beef??????? I always use the leanest I can find. I tried these and didn’t like the grainy texture. I loved Dairy Queen loose meat but don’t remember a grainy texture. I’m from Janesville, Wisconsin and we used to get Maid-rites from Dave’s Frostop root beer stand. Best burger I have ever had. Sadly, they have been out of business for over 20 years. I’ll give your recipe a try to see if they bring back the memories! We grew up on homemade maidrites. We browned and drained hamburger, Seasoned with salt,pepper and healthy squirt of mustard. Lastly we put a couple tablespoons of cream of mushroom soup to hold it all together. One of my favorite meals.